At our Toscana Italian restaurant we serve authentic Italian ‘dolci’, including tiramisu, panna cotta and berry sorbet. Some desserts have come and gone from the menu over the years but these 3 are definitely Italian desserts that the Irish just love! No meal is complete without a dessert, no matter what its origin or nationality. We all need a little sweetness in our lives! When eating out, the dessert is often the most satisfying and memorable part of a meal. Food is as much about pleasure as it is a biological necessity and the dessert is the most pleasing part of a healthy, well-made meal. The origins of these three desserts are hazy and disputed and there are many variations, but one thing is for certain: if they are made with care and expertise they can be an exquisite way to finish a meal. 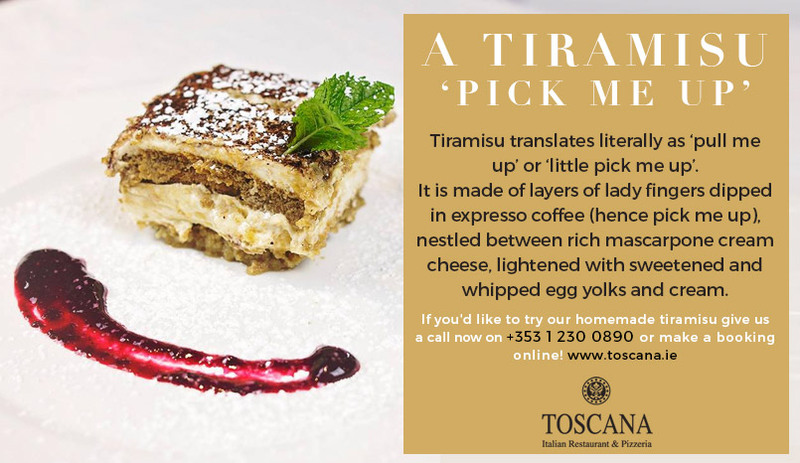 Tiramisu translates literally as ‘pull me up’ or ‘little pick me up’. It is made of layers of lady fingers dipped in expresso coffee (hence pick me up), nestled between rich mascarpone cream cheese, lightened with sweetened and whipped egg yolks and cream. Most experts agree that it originated in the Veneto region of northern Italy in the 1960s. A confectioner named Roberto Linguanotto is believed to have created it for his restaurant, Le Becchere. However, other regions such as Piedmont and Fruili Venezia Giulia claim to have invented it too. Panna cotta is another famous Italian dolce, which probably originated in the Piedmont region. 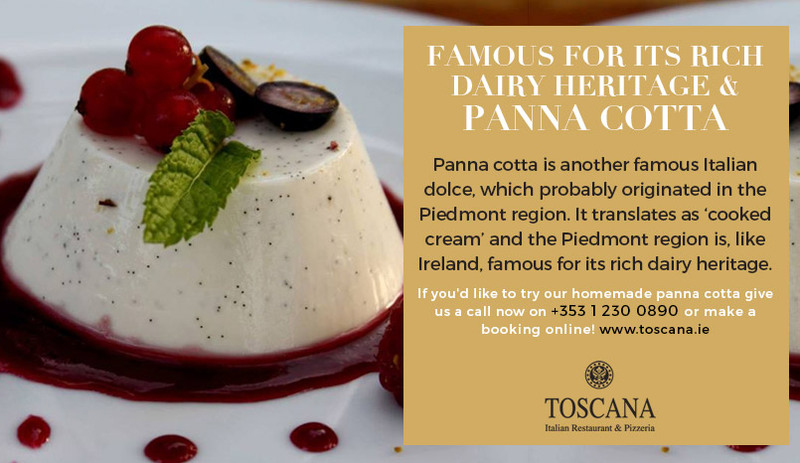 It translates as ‘cooked cream’ and the Piedmont region is, like Ireland, famous for its rich dairy heritage. Traditionally, the cream is cooked with honey and egg whites but these days it is often made with sweetened cream held together with a gelatin and served with a fruit compote, caramel or chocolate sauce. 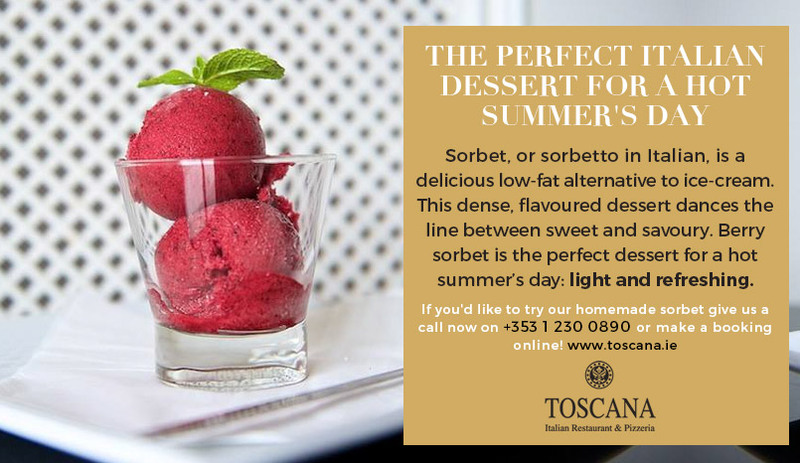 Sorbet, or sorbetto in Italian, is a delicious low-fat alternative to ice-cream. This dense, flavoured dessert dances the line between sweet and savoury. Berry sorbet is the perfect dessert for a hot summer’s day: light and refreshing. Here at Toscana’s, we have seasonal strawberries and raspberries fresh from our farm in Co. Wicklow, or the Garden as it is often called which we use in our sorbets when available. Although not strictly speaking an Italian dessert, there is a tradition that it was invented by the Roman emperor, Nero, when he had runners along the Appian way pass buckets of snow hand over hand from the mountains to his banquet hall where it was then mixed with honey and wine. Like all our food, our desserts are made with lots of expertise and TLC. We take pride in the fact that every dish we prepare is the best we can make it no matter what stage of the meal it is and this means desserts that are healthy, delicious and made with the freshest, organic produce. You can tell just by looking at our desserts that they are going to be special! Three famous desserts that are made up of mostly dairy products as well as fruit, namely strawberries and raspberries: all produce available in abundance in Ireland. 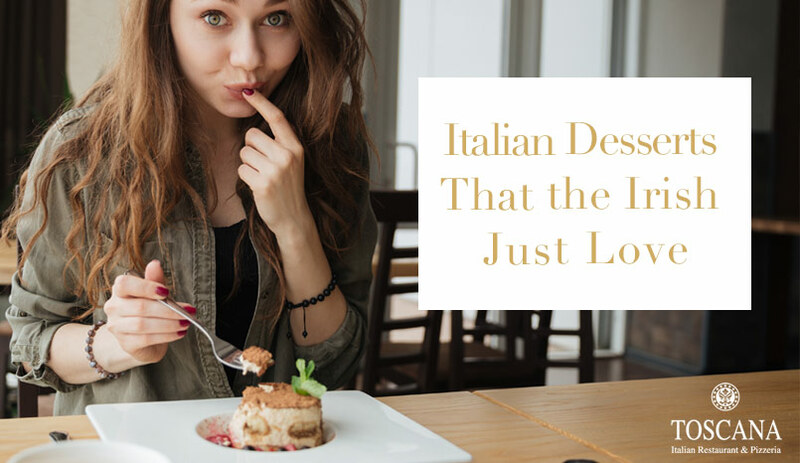 Therefore, Toscana Italian Restaurant is ideally placed to provide the freshest and most delicious Italian desserts outside of Italy, just like it is for all the food we make and serve here. The Italian – Irish connection, centuries old, is stronger than ever and we are proud to honour that tradition in our meals. We marry the best of both countries which is why we believe we are probably the finest Italian restaurant in Dublin. If you’d like to make a reservation you can book online or give us a call now on +353 1 2300 890.